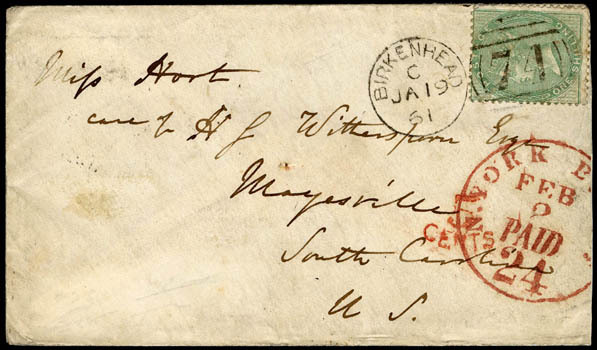 Confederacy, 1861 (Jan. 19) Birkenhead, England to Mayesville S.C., cover bearing G.B. 1s green (28), corner crease, tied by "Birkenhead JA 19 61" duplex, Liverpool (1.13) oval backstamp and red "5 Cents" credit handstamp, carried by Cunard Line Arabia from Liverpool Jan. 19th to New York arriving Feb. 1st, red "N. York Br. Pkt. 'Paid 24' Feb 2" exchange cds, Very Fine and scarce transatlantic use to Independent State South Carolina. 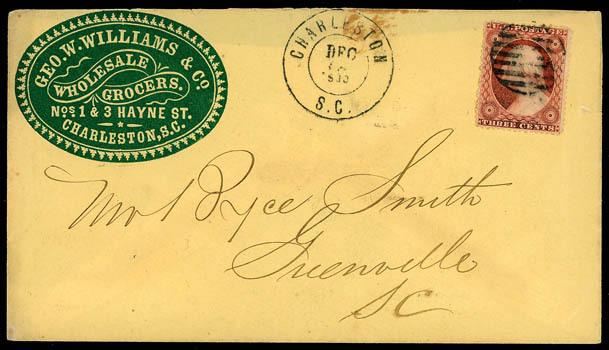 Confederacy, Charleston, S.C., Dec 28, 1860, cds on cover to Greenville, S.C., franked with U.S. 1857, 3¢ dull red tied by matching grid handstamp, green "Geo. W. Williams & Co., Wholesale Grocers" cameo corner card; small cover stain and tear at top, otherwise Very Fine, South Carolina was the first state to secede from the Union on December 20, 1860; with 2001 P.F. 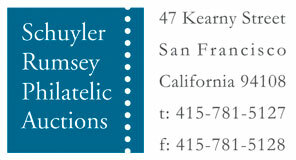 certificate stating postmark is Dec 20th or later. Confederacy, Morton Miss., Jan 27, 1861, clear strike of cds on U.S. 3¢ red (U27) buff star die entire, indicia cancelled by manuscript to New Orleans La., Very Fine and scarce Independent State use. 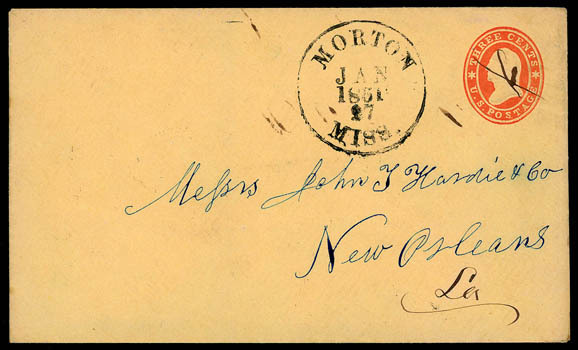 Confederacy, New Orleans La., 1 Feb (1861), cds ties United States, 10¢ green (35), s.e. 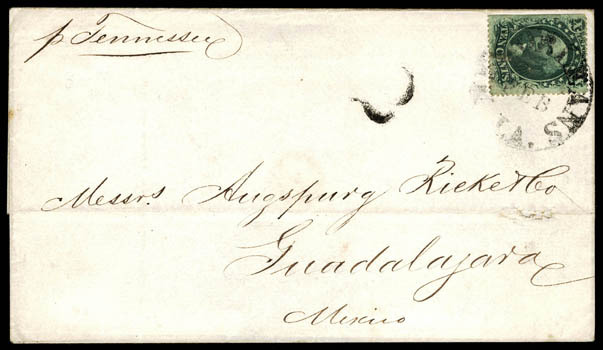 at left, faults, on 1861 folded cover to Guadalajara, Mexico, endorsed "p Tennessee" at top left, Mexican "2" reales due handstamp, inside docketed Jan. 31st 1861; erosion spot, otherwise a Very Fine and scarce Independent State use to Mexico. 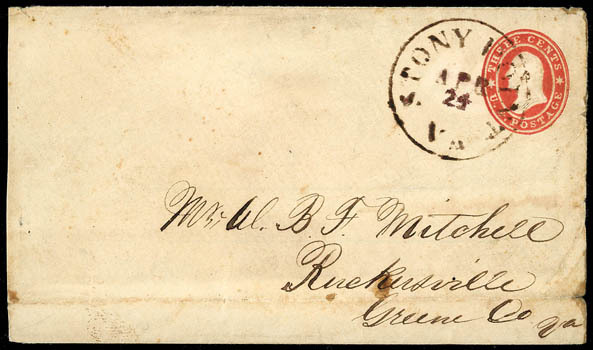 Confederacy, Stony Point, Va., Apr 24, cds in rare true brown shade, addressed to W. B. F. Mitchell, Ruckersville, Va.; slightly reduced at left and horizontal fold across bottom, F.-V.F., a scarce Independent State Use (only independent for 20 days and this just shortly after secession), Stony Point ISU catalogs $300 in CSA Catalog without regard to rare brown postmark, ex-Thayer.